Two weeks ago we had a run in with a shark in the ocean. This weekend Steve Irwin died in the ocean. This is how my four and eight year old would like to enjoy the ocean from now on. Safe and sound, bobbing along out of harm's way. 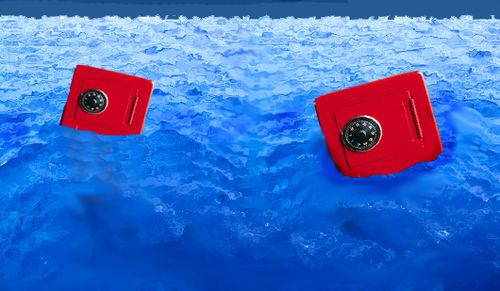 Never mind the fact that safes don't float and the minute it sinks to the ocean floor, no one is around to dial the correct combination for the lock. This kid invention is strictly in the prototype stage. I LOVE IT! The idea of conflicting definitions is really great. Not to mention the mixture of painterly vs. real image. I really think this is great. Pharmacists, hence, are definitely the authorities on medicine remedy and they are the principle health professionals exactly who increase medications work with to deliver sufferers with good health and fitness outcomes.